In the late 1970’s Bryan fell in love with the city of New Orleans and eventually moved to the Crescent City on Jan 6, 1982. Bryan Lee has been a fixture of the French Quarter music scene ever since. His guitar brings the Chicago styled blues of Luther Allison, as well as Albert King and Albert Collins down to the Crescent City. Bryan Lee made his stand, performing 5 nights a week for over 14 years at the Old Absinthe House. Bryan Lee is referred to as “A New Orleans Blues Institution” a name given to him by Quint Davis, producer of NOLa Jazz and Heritage Festival, which Bryan has performed at for 26 years now. During the 1990’s Bryan and the Jump Street Five Band initiated a long recording deal with Justin Time Records from Montreal, Quebec, Canada.The collaboration and Lee’s individual sets would take him to recording 13 albums over the coming years. In 1995, Bryan shared his stage with KWS when Kenny was just 13 years old. Bryan was so blown away by Kenny’s guitar playing that he invited Kenny to be on his “Friday Night – Saturday Night Live from The Old Absinthe House “recording along with the great James Cotton and Frank Marino. Kenny also made a special guest appearance on Bryan’s latest CD: ” My Lady Don’t Love My Lady “ (2010 Justin Time)along with Buddy Guy. After the closing of The Old Absinthe House and the tragedy of Katrina hitting NOLa as it did, Bryan formed a new band and hit the road. Picking up Brent Johnson on guitar and John Perkins on drums, Bryan Lee and The Blues Power Band started touring all over the world. One of many highlights of Bryan Lee’s career would be performing at BB King’s 80th Birthday in 2005, as well as being a special guest on the KWS “Blues from the Backroads, 10 Days Out” (2007). During this 6 week tour Bryan was able to connect with the late great musicians such as Pinetop Perkins, Hubert Summlin, Eddie Kirkland and Willie Big Eye Smith along with Buddy Flett, among many others. Bryan Lee performed hit original hit tune” Tina Marie” with KWS and friends on the Jay Leno Show in 2007 as well as on the Tavis Smiley Show. In 2010; Bryan was nominated for a Grammy Award (“Live! In Chicago” with KWS and Friends) and won a BMA for Best Rock Blues Album (“Live! In Chicago” with KWS and Friends). 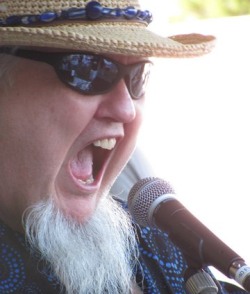 In 2012 Bryan played his 26th New Orleans Jazz & Heritage Festival and along The Blues Power Band to a packed tent. Bryan Lee is anxiously awaiting the release of his new CD with Severn Records: David Earl as producer,featuring Kim Wilson on harp and the Severn Records house band in spring of 2013.